The December holidays are upon us and more and more people are heading to the malls to find the perfect gifts for their loved ones. Stores are decorated with festive lights and colors and people are scurrying everywhere to get their shopping done. While the holidays are supposed to be fun and bright, there is an increased risk of slip and fall accidents during the busy shopping season. Not only do you have to worry about finding a spot in the parking lot, you also have to contend with thousands of other people once you get inside the stores. 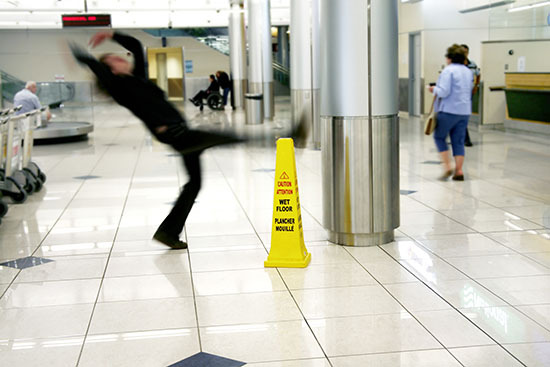 If you have been the victim of a slip and fall accident at your local mall, finding a personal injury lawyer in Northeast Philadelphia should be your next move. Store employees have many added responsibilities during the holidays and loose carpeting or spilled liquid on tiled floors just outside the store may go unnoticed as an influx of customers bombards their stores. However, this doesn’t excuse the store or mall management from the responsibility of ensuring the safety of every shopper. A malfunctioning escalator can be very dangerous and if it lead’s to injury, the injured person is often entitled to fair compensation. Malls are filled with busy shoppers who eat while shopping. Be wary of spilled coffee or a Cinnabon on the floor as you hustle through the mall with the rest of the crowd. As store staff rushes to restock shelves, they leave boxes, containers, pallets, and even hand trucks in the aisles. This can cause serious falls to customers. Pay attention when going around corners and navigating past these hazards. The soft glow of holiday lighting creates a comforting ambiance that is used to draw customers into stores. But, holiday lights alone are not enough lighting needed to spot hazards like uneven floors, ripped carpeting or broken tiles. Remember to step carefully. Rainy and snowy weather mean that water, slush, and mud get tracked into mall entrances and stores. This turns these entryways into dangerous walking paths. Wear boots ith good tread or shoes and step carefully to avoid an accident. As a slip and fall legal team, Martins Mill Legal Center has helped many people recover damages after being injured at the mall. If you’re shopping this holiday season and an employee’s negligence or a mall management oversight causes you to be hurt, please contact us right away. We’ll make sure that you’re properly represented. Finding a personal injury lawyer in Northeast Philadelphia is easier when you understand what you are looking for. Crowded Shopping malls pose slip and fall hazards. If you have fallen victim to one, let us know. If you have any questions about slip and fall accidents, contact the team at Martins Mill Legal Center today. We can help.